Nesh-Deeka is an Argonian proprietor of Nesh-Deeka's Shop of Musical Wonders in Lilmoth, which specializes in Argonian musical instruments - particularly the vossa-satl. He is looking for someone to help him secure a deal to export them outside Murkmire. The Sounds of Home: Help a local crafter export his musical instruments outside Murkmire. When he is spoken to in his store he will say "Welcome to Nesh-Deeka's Shop of Musical Wonders! Please, have a look around. But touch nothing. Some of these instruments are very old." Once Sunken Treasure is completed, he can instead be found outside his shop, where he'll make you a business proposition. "You look like someone who knows a good business opportunity when you see one. Much profit! Will you hear me out?" What kind of business opportunity are we talking about? "Increased business for me, extra gold for you! I believe the Imperials call it a win-win situation. The prominent trader, Captain Jimila, arrived in port. If we can convince her to export my vossa-satls, the possibilities for profit are endless!" "The instrument of my people! 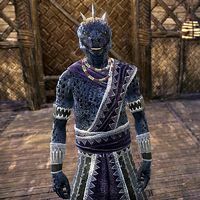 For many Argonians, the dulcet croaks of a vossa-satl remind them of the sounds of home. Act as my envoy and bring this opportunity to Captain Jimila. Help me secure a trade agreement and I will compensate you." All right, what do you need me to do? "First, we must learn everything we can about Captain Jimila and how to make a good impression. Talk to people who have dealt with her before, such as Tolwin, Claws-the-Ghosts, and Ruja-Wan. I'll catch up with you so we can plan our next move." Why use me as an envoy? Why not contact Captain Jimila directly? "Appearances, beeko, appearances! Jimila travels the world and has refined tastes! One cannot simply walk up to her and offer their wares like a wandering merchant! No, we must make a good impression. And to do that, I need you to serve as my envoy." Does an envoy really make you seem more important? "Of course! Outsiders respond better to people they see as important. We're partners. Equals in this endeavor. Serving as my envoy is for appearances only. It makes us both look good and improves our chances to secure a deal with the Captain." "You have worked with the legendary Khajiit sea captain? Beeko! The sun truly shines on me today! Even so, I do not want a deal that's purely dependent on her good will toward you. We need to prove that I'm a worthy trade partner." "Ah, my friend and partner! Were you able to find out about Captain Jimila's likes and dislikes? Anything that will improve our chances to make a deal would be helpful." The Captain reacts well to respect, bargaining in good faith, and a no-nonsense attitude. "Well, then, we should have little trouble. I am all those things and more when it comes to business! We just need to complete a vossa-satl so we can present it to the good Captain. That is sure to convince her to deal with us!" "You can gather the frogs while I put the finishing touches on the instrument! We'll need moss-foot croakers, ruby hoppers, indigo tree frogs, and sun-blessed toads. Here. I wrote everything down so you won't have to remember all the details." Why do you need me to gather frogs? "What a strange question. We need the frogs for the vossa-satl. How else would the instrument produce its sweet-sounding melodies? The note explains how to catch each frog. Once you have them all, return to my shop and we'll finish the instrument." I have a couple of questions before I agree to gather these frogs. "Ask and I'll do my best to answer. Partners must be completely honest with each other. Providing detailed explanations is just the mushroom on the log when it comes to total honesty." I don't understand what the frogs have to do with a musical instrument. "The frogs are the heart of the vossa-satl! Each little croaker, when nestled in its chamber inside the instrument, adds its voice to create the melodious sound. Happy frogs produce the most harmonious and joyful sounds!" "Imagine being pampered and cared for in a safe, comfortable environment, singing alongside your closest and dearest friends. That's the life of a vossa-satl frog! Every nest inside the instrument is warm and moist, full of mud and tasty treats." Where do I find the frogs you need? "Moss-foot croakers nest in the reeds that grow along the shore east of Lilmoth. These playful frogs have no natural predators. They eagerly greet visitors. I suggest you gather these green, little fellows first, as they are easiest to catch." Tell me about the other frogs. "Second, seek out the ruby hoppers. These red frogs like to sun themselves on stones around Lilmoth. Approach cautiously, however, or the ruby hopper will run. Once frightened, they often hide by the big tree at the center of town." What about the third frog? "Ah, the indigo tree frog! Nests high up in the trees but loves the taste of fleshflies. Find the right trees, gather some insects, and release them beneath the branches. When the blue frogs hop down to feast, simply grab them!" And the final frog you need? "Sun-blessed toads. They nest in mud pits, emerging every few seasons to mate. To lure them out, make a musk out of stench sedge, salt rush, and joymallow. Find a pit that has a croak-wheel and pour the musk on yourself. Then just turn the wheel!" All right, I'll gather the frogs. / That's what I needed to know. I'll gather the frogs now. Once you have finished speaking with him, he will say "I'll be in my shop, preparing the vossa-satl. See you soon, partner!" While you are hunting for frogs, Nesh-Deeka will find you while you are looking for ingredients for the toad musk, saying "Hail again, friend! How goes your frog collecting?" "I hate to bother, friend-partner, but you have been gone for a long time. Are the frogs giving you any trouble? I only ask because striking a deal with Captain Jimila is terribly important to me." I gathered all the frogs except for the sun-blessed toads. "Yes, yes, I should have noticed. Your basket practically bulges! As for the sun-blessed toads, they are the most slippery of the bunch. Do you need me to tell you how to gather them again?" Tell me how to gather the sun-blessed toads. "Sun-blessed toads nest in mud pits, emerging every few seasons to mate. To lure them out, make a musk using stench sedge, salt rush, and joymallow. Find a pit that has a croak-wheel and pour the musk on your head. Then just turn the wheel!" I don't need a reminder. "Then don't let me keep you, beeko. Get out there and gather the last of those toads." If spoken to again he will warn you to be careful with the toads, saying "Be very gentle when handling the sun-blessed toads. They can be quite fragile when they become excited." Once you have collected the toad, Nesh-Deeka will be waiting outside his shop. "Ah, is that the aroma of toad musk I smell? How delightful! I hope you were gentle with the little croakers. They need to be calm and relaxed to produce the most pleasing sounds." The frogs are in this basket, all safe and sound. "So they are! How good of you to join us, little croakers! Let's go inside, beeko. Our happy chorus must be fitted into the vossa-satl. I envy them their new lives of pampered luxury. We should all be so lucky!" You can watch him tune the vossa-satl. Nesh-Deeka: "Welcome to your new home, my little friends. Now let's listen to how it sounds." Nesh-Deeka: "Pure perfection! Take this masterpiece to Captain Jimila with my compliments. That should secure us a deal!" "Our little friends are happy, I am happy, and Captain Jimila will be happy very soon. Oh, sun-filled day! Remember, when the Captain asks you who created this masterpiece, shout my name with great enthusiasm. Nesh-Deeka, the pride of Lilmoth!" Any idea where I can find Captain Jimila to deliver the vossa-satl? "Of course! I always keep an ear hole open for important information such as that! Last I heard, Captain Jimila was drinking at the tavern. Go to her, present yourself as my envoy, give her the vossa-satl, and get her to agree to export them." "I wish you luck in your negotiations with Captain Jimila. Please do not let any harm come to the vossa-satl. The deaths of all those tiny croakers would dry my scales something terribly." When you have convinced Captain Jimila to start selling vossa-satls, Nesh-Deeka will be thrilled with the news. "So tell me, friend-partner. Was Captain Jimila impressed? Will she sell my vossa-satls in far-off lands?" You have a deal. The Captain will take five vossa-satls to start. "The sun shines on my scales! Five vossa-satls! I am going to need so many frogs. No worries, beeko. I will gather the little croakers myself. The next few days will be very busy, but very profitable! Speaking of profit, this is for you. Thank you!" "Thank you for all your help, friend-partner. I could speak all day with you about the wonders of Murkmire, but I have work to do and new vossa-satls to craft. Soon, all Tamriel will fall asleep to the soothing sounds of beautiful frog song!" This page was last modified on 24 March 2019, at 17:12.